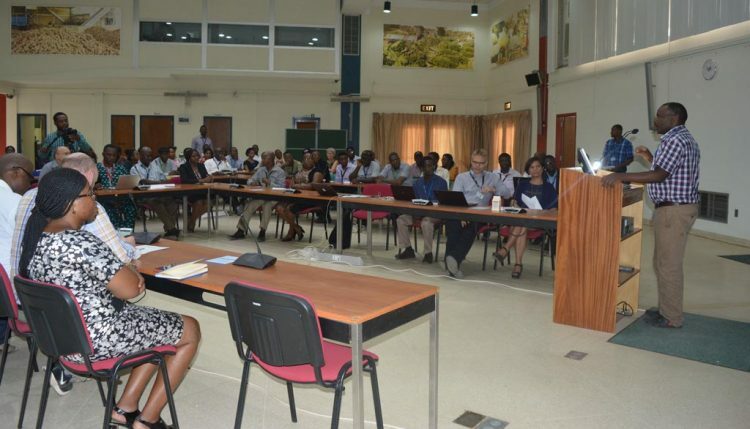 IITA officially launched its new Intranet platform on Sharepoint on 5 February as part of efforts to streamline workflows and enhance operations throughout the Institute. The platform was jointly developed by the Communication and Data and Information Managament units. Tonny Omwansa, Director, Research Support, giving the opening remarks at the Intranet launch. The unveiling attracted staff at headquarters and in the hubs/stations (via a webinar link), who were curious about the new platform and how it works. The platform aims to transform and enhance internal collaboration, information retrieval and sharing, and team workflows within the institute. SharePoint is a browser-based content management system that provides a centralized, protected space for document sharing and collaboration. The SharePoint intranet centralizes access to enterprise information and applications, helping an organization to manage its internal communication better. It is a leading tool used by 78% of companies to develop their online and offline capabilities, document management, and collaboration. Tonny Omwansa, IITA’s Director Research Support Services (RSS) commended the joint efforts of CU and DIMU in ensuring that colleagues are ushered into a future geared towards more improved and effective communication among IITA staff all over Africa. “I am gratified for your wonderful support to the research support team. Not only are we celebrating an announcement, hopefully, we will become adopters and influencers of the change,” he added. In his keynote talk, IITA Director General, Nteranya Sanginga, urged members of staff to “integrate into the new way of working as it will make life easier within the Institute.” He suggested that the RSS team organize a training to equip staff on how to use the platform so that everyone can benefit and contribute to the new way of collaboration. Tunde Ajayi, IITA Web Developer, and Olatunbosun Obiyele, Institutional Database Developer, explained the platform’s functionalities and procedures, while highlighting the benefits of team collaboration, document management, project sites and portals, intelligent search, process automation, insight, and analytics. The new intranet page was officially launched by May-Guri Saethre, IITA Deputy Director General, Research for Development (R4D).